Pavement. The kings of slacker rock. The definition of ’90s indie rock. PAVEMENT. I’ve been listening to the album and writing my review at the same time but I’ve just gone in and deleted everything I already wrote. Because what hasn’t been said about Pavement already? Nothing I say here will be groundbreaking at all. I guess I just want to let everyone know that this Best-Of now exists. But what’s the point, really, of this record? If you like Pavement, you probably/should already know everything on here. If you don’t like Pavement, you don’t care about this release at all because it doesn’t even contain any new material for you to potentially hate on. 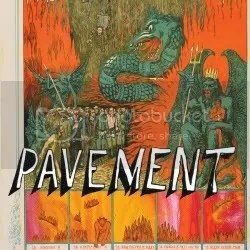 And if you’ve never heard of Pavement, you should start with their 1993 debut album, Slanted and Enchanted, not this gobbledy-gook of a record that ignores the chronological order of the band’s releases. It’s so hard to pick out what should be on a Pavement “Best-Of” (since they didn’t have any huge hit singles); there’s bound to be material on their actual albums that you like more than some of the selections on here. “Silence Kid” is not on here, so clearly this collection is not “The Best of Pavement,” as it advertises. Also, I don’t understand the cover art. But Pavement is still awesome. Listen to their actual albums. This entry was posted on March 28, 2010 at 12:23 am and filed under TheSlacker. You can follow any responses to this entry through the RSS feed.